Craving Carolina Herrera's recipe for Pommes Toupinel or Cynthia Rowley's Mac 'n Cheese? How about Zac Posen's Butterscotch Brownies? Look no further than the CFDA's, Council of Fashion Designers of America's cookbook. 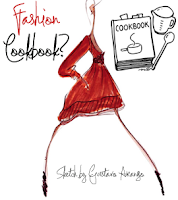 WWD reports that the book will feature over 100 recipes and food-meets-fashion sketches from top fashion designers. The designers will actually sketch their food creations. CFDA executive director, Steven Kolb says to "think of it as a hybrid-art book-cookbook." As a passionate foodie who has a great appreciation for the creative genius that goes into a fashion designer's collection, I think this book sounds brilliant! The book will be released this September. Where did they think up this idea? Kolb says the idea came from a "one-of-a-kind clipbook of recipes donated by designers that CFDA president Diane von Furstenberg had bought at the original Seventh On Sale." The forward will be written by......drum roll please. Martha Stewart is writing the forward, and Lisa Marsh is the book’s author, giving context to the designers’ choices “to bring these recipes to life for the reader,” Marsh said. Do I see a Martha TV show special on this book in the near future? I think yes. Read the full report here at WWD.